GLENWOOD CITY - The St. Croix Valley PRCA Rodeo is currently accepting applications for the 12th annual St. Croix Valley Rodeo Queen position. Applications are due to the committee by March 31, 2019. We are currently looking for young women ages 16-23, that live in a 60 mile radius from the St. Croix County Fairgrounds in Glenwood City. All contestants must be able to ride a horse well, speak to the public about the sport of rodeo and other topics as pertain to her reign. The primary function of the St. Croix Valley PRCA Rodeo Queen will be to promote the rodeo and the queen program in rodeos, parades, on the radio and by representing the rodeo at various social events. 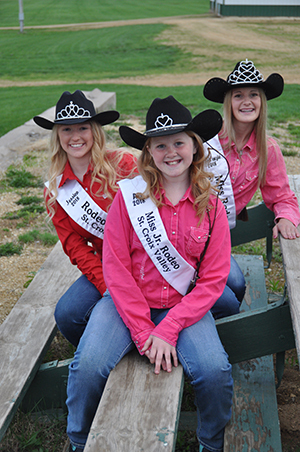 We also have a Jr. Miss St. Croix Valley PRCA Rodeo Princess for aspiring Rodeo Queens. This wonderful opportunity is open to girls between the ages of 13-15, just fill out the same application as the Rodeo Queen candidates and submit it by March 31, 2019. Application materials are available and can be downloaded by clicking Queen's Application. Direct all questions to St. Croix Valley Rodeo Queen Coordinator, Theresa Hoffman at 715-781-1046 or thoffman1505@gmail.com. We look forward to hearing from you. Go Rodeo! Indoor Winter Storage will take place on October 13 and 20 from 8:00 a.m. until Noon. Motor Homes, Campers, Boats, etc. are welcome. Please enter through the far south gate (C) all other gates will be closed to incoming traffic those days.